For this post, I have put together a collection of the best carbon monoxide detectors currently available. Prevention of Carbon Monoxide poisoning remains a vital public health issue, requiring public education on the safe operation of appliances, heaters, fireplaces, and internal-combustion engines, as well as increased emphasis on the installation of carbon monoxide detectors. Carbon monoxide is tasteless and odorless, and therefore can not be detected by visual cues or smell. The United States Consumer Product Safety Commission has stated, "carbon monoxide detectors are as important to home safety as smoke detectors are," and recommends each home have at least one carbon monoxide detector, and preferably one on each level of the building. These devices, which are relatively inexpensive and widely available, are either battery- or AC-powered, with or without battery backup. In buildings, carbon monoxide detectors are usually installed around heaters and other equipment. If a relatively high level of carbon monoxide is detected, the device sounds an alarm, giving people the chance to evacuate and ventilate the building. Unlike smoke detectors, carbon monoxide detectors do not need to be placed near ceiling level. The following carbon monoxide detectors use the latest innovative components to meet your needs and help you stay safe. So here is my list of The 10 Best Carbon Monoxide Detectors. 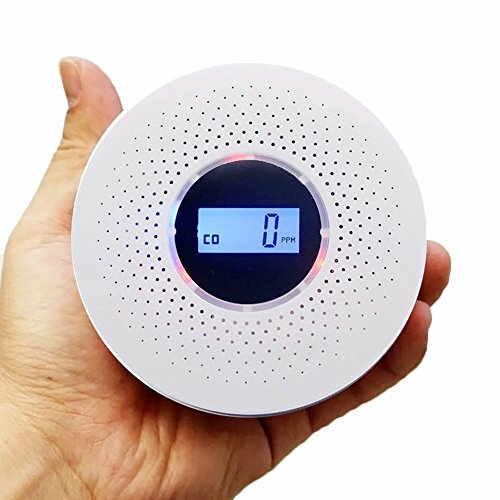 The First Alert SCO5CN carbon monoxide and smoke alarm uses an electrochemical carbon monoxide sensor-the most accurate technology available. The alarm uses photoelectric smoke sensing technology which is environmentally friendlier and which reduces nuisance alarms, making it ideal for cooking areas. Great for sensing slow smoldering fires quickly. The permanent sensors last the lifetime of the alarm. A low battery signal alerts you to replace the battery and end-of-life alarm of three chirps alerts you to replace the unit. 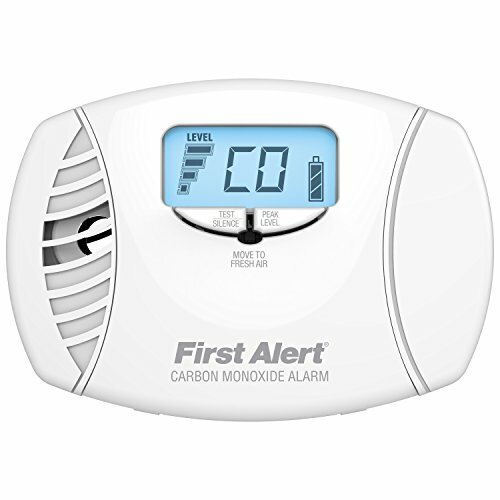 The First Alert CO605 Carbon Monoxide Plug-In Alarm features an electrochemical CO sensor to alert you to dangerous carbon monoxide. This personal carbon monoxide detector plugs into any standard electrical socket and monitors your space for elevated carbon monoxide levels. A clear, 85-decibel alarm sounds when levels become hazardous. Features a battery backup that allows for continuous monitoring, even in the event of a power failure. The simple, user friendly design makes this CO detector easy to set up and operate. Features an end-of-life warning that lets you know when it is time to replace the unit. 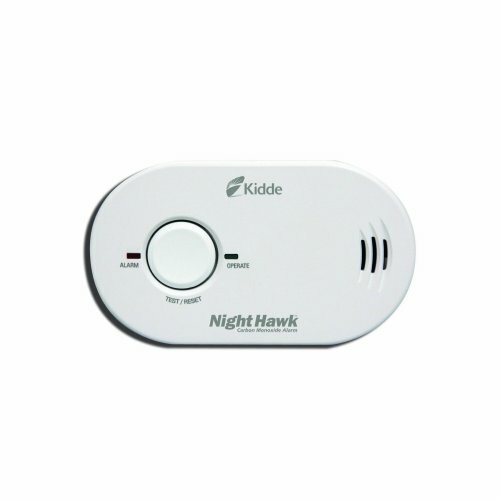 Designed for home use, the Kidde KN-COPP-3 Nighthawk is a UL-listed, A/C-powered, plug-in CO alarm that utilizes sophisticated electronic components and sensor technology to protect you and your family from the dangers of CO.
Plugs directly into a standard A/C outlet and includes a 9-volt battery backup that provides continuous monitoring of CO levels--even during power outages. Display clearly shows levels of CO that the unit has detected and stored-- from 30 to 999 ppm--and it updates every 15 seconds to indicate any abrupt changes or alarming trends. The display also shows the peak CO level recorded by the alarm since it was last reset or unplugged. Blinking dot in the lower right-hand corner of the display denotes normal operation, so you can trust that it's working. Test alarm function by pressing the test/reset button at any time to verify that the horn and electric circuitry are operating properly. Low-profile design that makes it suitable for any room in your home. The detector can be plugged into any standard A/C outlet. Plug can be snapped into the back of the unit and can be rotated so the alarm remains vertical, independent of whether the electrical socket is mounted vertically or horizontally. 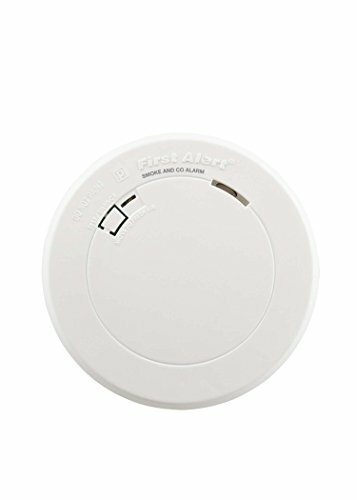 The First Alert PRC700 Combination Smoke and Carbon Monoxide Alarm is designed to provide the same trusted functionality with a new, slim profile that blends into your home décor. 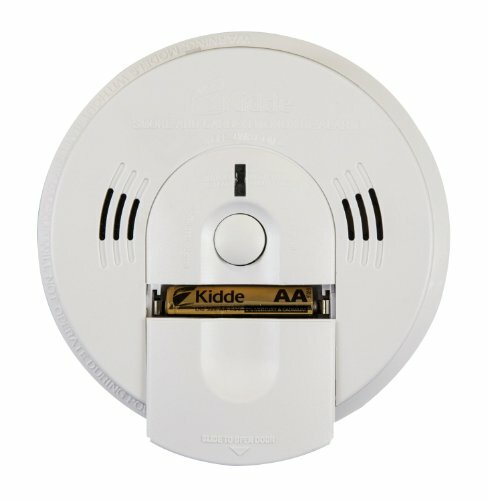 This smoke and carbon monoxide detector provides comprehensive detection by featuring a sensitive photoelectric smoke sensor and an advanced electrochemical carbon monoxide sensor. 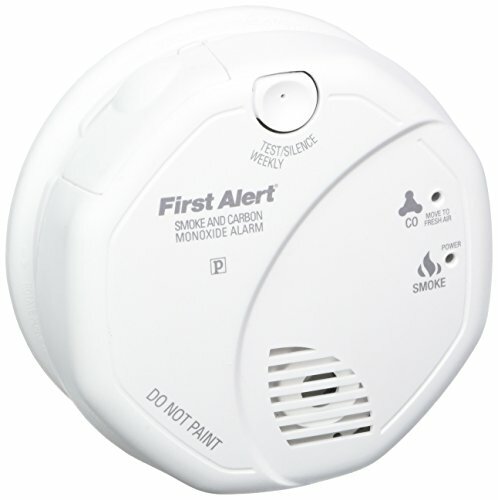 The battery-operated smoke and CO detector can be installed easily, with no wires or electrician required. One-touch alarm silencing and test feature, and will continue monitoring during power outages. The twist-lock mounting system on this detector makes replacing batteries easy. 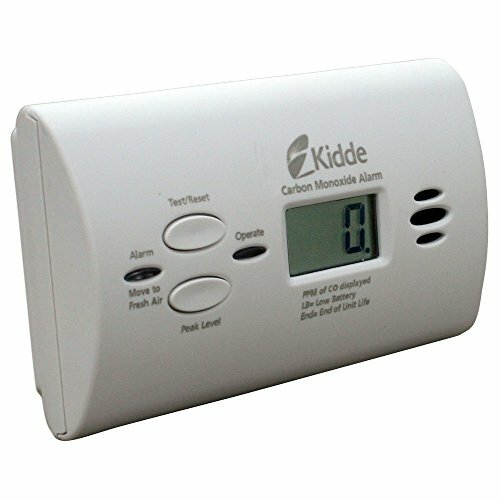 The Kidde KN-COPP-B-LPM battery operated CO alarm provides continuous monitoring of CO levels, even during power outages when many CO incidents occur. The digital display feature allows for easy viewing of carbon monoxide levels from 30-999 PPM (parts per million). Includes a slide-out battery door that gives immediate access to the batteries and a safety feature that makes it difficult to close the cover without the batteries being installed. An LED lighting system on the unit signals power levels and sourcing: the green LED will flash once every 30 seconds to indicate the alarm is operating properly when power is present, and the red LED will pulse to indicate carbon monoxide has been detected until the device is reset or the CO threat is eliminated. 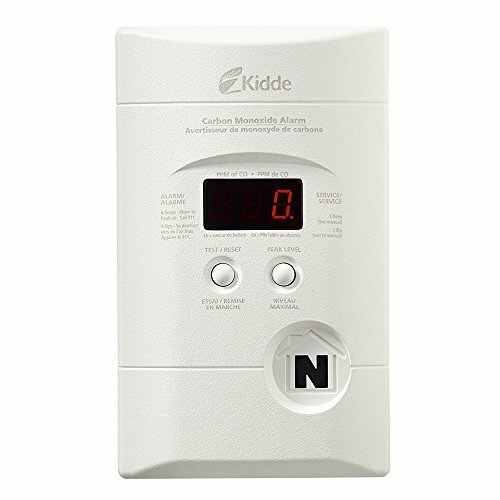 The Kidde KN-COSM-BA Combination Carbon Monoxide & Smoke Alarm provides two important safety devices in a single unit. The voice alarm eliminates any confusion and clearly warns you and your family of a smoke or carbon monoxide danger, or if your battery is in need of replacement. This technologically advanced combination alarm is battery operated protecting you and your family even during a power outage when many incidences occur. 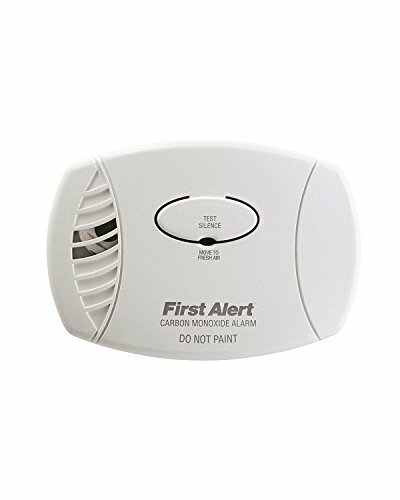 This combination smoke/CO carbon alarm features an 85dB horn and voice that announces "Fire", "Carbon Monoxide", and "Low Battery" warnings when detected. Features a photoelectric sensor that detects the smoke most commonly produced by smoldering fires, providing sensitive detection while minimizing false alarms from cooking smoke or shower steam. The advanced electrochemical CO sensor detects carbon monoxide leaks from multiple sources, such as faulty fuel-burning appliances, blocked chimneys, and generators running inside or too close to homes. Unique alarm sounds and indicator lights on the face of the detector distinguish a smoke warning from a carbon monoxide warning. Offering a small, sleek design that's suitable for all living areas, the Nighthawk KN-COB-B-LS provides you and your family with a loud warning signal against the dangers of elevated carbon monoxide levels. Continuous monitoring of CO levels, even during power outages when AC-only units are not providing protection. Includes multiple mounting options, allowing for installation on a wall or a tabletop. Features two color LEDs for at-a-glance status updates. The green LED flashes once every 30 seconds to indicate the alarm is working properly. A red LED will pulse to indicate that carbon monoxide has been detected. When the unit detects carbon monoxide, the alarm sounds four short beeps (rated at 85 decibels at 10 feet), followed by five seconds of silence, and then followed by another set of four short beeps. The First Alert CO615 carbon monoxide alarm uses an electrochemical carbon monoxide sensor-the most accurate technology available. Installation is as simple as plugging it in to any wall outlet. Its easy-to-read backlit digital LED display gives you a clear read-out of current CO concentrations in parts per million. The alarm includes a battery back-up giving you peace of mind in a power outage. The front-open battery compartment allows easy battery change without dismounting the alarm. The unit monitors and re-alarms if carbon monoxide levels persist sounding a loud 85-decibel horn. An audible and visual low battery signal alerts you to replace the battery and an indicator alerts you when a battery has been removed. An end-of-life alarm of three chirps alerts you to replace the unit. 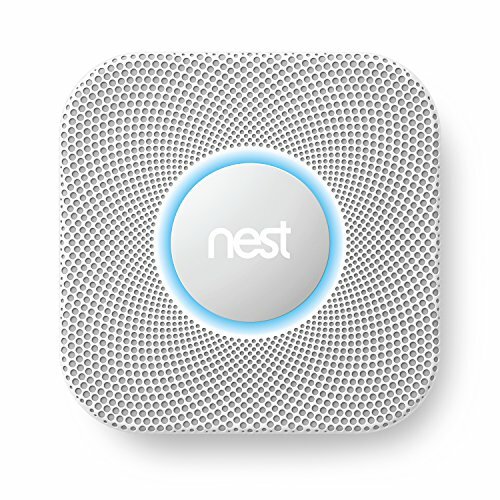 The Nest Protect smoke carbon monoxide CO alarm does much more than just sound a shrill alarm when there is danger in your home. Speaks to you telling you where the danger is and what the problem is. Gives you peace of mind by testing itself constantly and showing you everything is working with a quick green glow when you turn off the lights. Integrates with your mobile devices and even messages you if the batteries run low avoiding that all-too-familiar midnight low-battery chirp. Speaks up to tell you if there's smoke or CO and tells you where the problem is so you know what to do. I hope this list of the best carbon monoxide detectors was helpful.